Let’s talk beauty sleep. Sleep is so important to our overall health, our mental health, our hair health, our skin health, literally everything. Without getting enough sleep you can’t function properly during the day but neither can your skin or your hair. Here are our tips to get the best beauty sleep of your life! Let’s start with the benefits, as if we need to convince you to sleep more. When you’re sleeping you’re giving your blood a break from moving around constantly and allowing your blood to circulate to your skin instead of the rest of your body. We all know what we look like when we’re sleep deprived, but when you get enough sleep you’re actually more likely to wake up with glowing skin. Sleep doesn’t just have benefits to your skin but it can improve your hair too! You’re more likely to experience hair loss if you aren’t getting enough sleep. When you’re sleeping your allowing your hair follicles to restore nutrients that your hair thrives off of to grow. The amount of sleep you get is crucial to how you look and feel but we can always take some extra steps to guarantee we’re getting the best beauty sleep. 1. Sleep on silk! We know you’ve heard this from us a million times but it has so many benefits to your skin and hair. Not only will you feel like a queen sleeping on silk but sleeping on silk prevents your hair from frizzing and breaking and prevents fine lines and wrinkles on your face that cotton pillowcases can cause. No matter what sheets you sleep on, make sure you’re washing them regularly to keep your skin and hair clean! Our favorite Silk Pillowcases are from SHHHSilk, they come in so many different colors and patterns you’re guaranteed to find something you love! 2. Before you sleep make sure your makeup is totally removed and skin is cleaned and moisturized before bed. Our favorite mask when we’re lacking in the sleep department is Summer Fridays’ Jet Lag Mask. Just put this mask on and wake up with glowing, renewed, and radiant skin! 3. We recommend using Kitsch’s Satin Sleep Scrunchie to sleep with your hair up in a loose bun, pony tail, or braid. We use the term loose so strongly you want your hair to be pulled back from your face and to decrease friction while you sleep but you don’t want to put your hair up tightly and cause breakage. Kick it up a notch and sleep with your hair in a Satin Sleep Cap. Kitsch’s Satin Sleep Cap is designed to fight frizz, encourages hair growth, and prevents breakage and all you have to do is sleep! 4. Sleep with a humidifier. Sleeping with a humidifier on will prevent dry eyes in the morning which is half the battle of getting up but it ensures that your skin is getting hydration while you sleep. 5. Fight puffy eyes before they start. There’s no worse start to your day than waking up with dark circles and puffy eyes. Use an under eyes mask before you sleep to combat them before they appear. Peace Out Puffy Under- Eye Patches deliver a de- puffing serum to your under eyes so you can wake up with puff free under eyes free of dark circles. 6. Keep a routine! Your body thrives off of having a routine, doing your bedtime routine at the same time every night and going to bed at the same time every night will make it so much easier for you to get to sleep at a decent time every night. Getting at least seven hours of sleep a night will seriously transform your life and most importantly your hair! Nighty night! 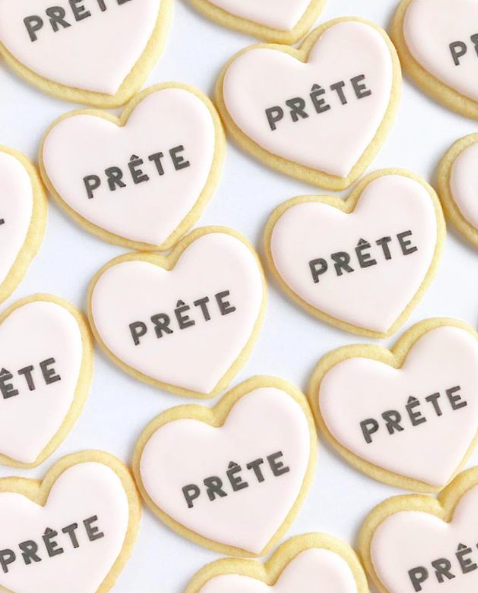 Don’t forget to follow us on Instagram @pretebeauty and book your next blowout with PRÊTE.